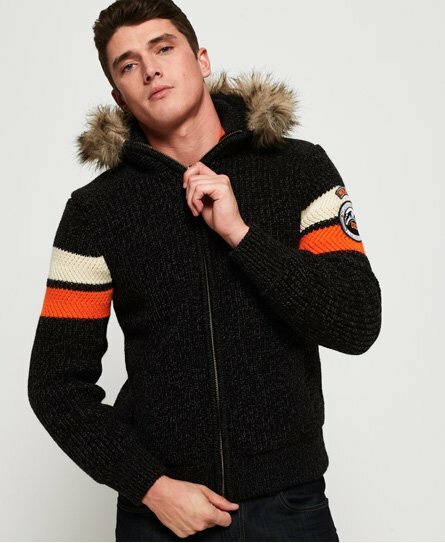 Superdry men’s Super ski dog hoodie. Layer up this season in the Super ski dog hoodie, a great zip up hoodie to keep you warm whilst still looking on trend. This hoodie features a knitted design, a Sherpa lined hood with a faux fur trim and a stripe design along the sleeves, back and inner collar. For a comfortable fit, this hoodie has been designed with ribbed cuffs and hem and two pockets for practicality. For the finishing touches, this Super ski dog hoodie also has a Superdry branded zip pull and Superdry patches on the sleeve.